Clasp/Buckle: 18K yellow gold Rolex deployant clasp stamped "1 70"
With reference 6239, Rolex inaugurated what can arguably be considered its most iconic, successful and collectible family of watches: the Cosmograph Daytona. Originally released in the USA in 1963, it became available in Europe only the following year. The American market was chosen for its closeness to the world of car racing. In fact, even the name Daytona was selected due to its American connotation, replacing the name “Le Mans” which had originally been devised for the model. 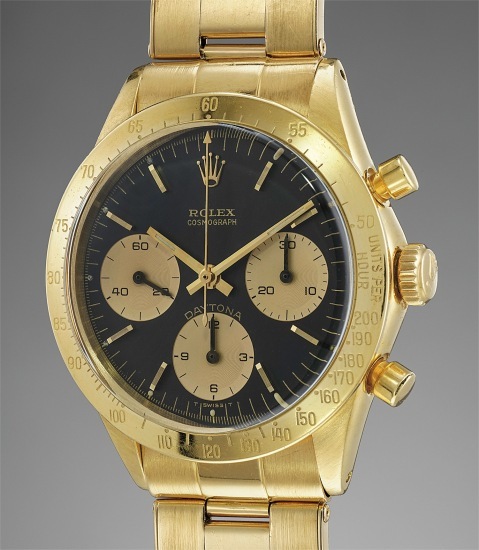 It is estimated that only about 450 examples were made in gold (either 18K or 14K), making the present example a highly collectible specimen of the first gold Daytona model made. Such a restricted production can be explained by considering the tool watch vocation of the model, which was conceived as a sport's watch and thus was preeminently demanded with the sturdy and lightweight stainless steel case. Adding to its undeniable aesthetic and historical appeal, the piece is offered by its original owner and features the very rare “71” riveted bracelet, produced for a short time in the late 1960s/early 1970s. The clasp is stamped “1 70”, showing how the gold case made in late 1968 was eventually sold in 1970, further confirming the scarce appeal these gold timepieces had on the market at the time. Ironically, such scarce interest is what eventually rendered them so rare. This rarity, combined with the stunningly goods looks, makes this watch one of the most appealing timepieces to the collectors of fine Rolex wristwatches.